If you’ve been aching to get your hands on some quality chunky yarn that’s soft, warm and full of rich color, then keep reading. AllFreeKnitting is happy to announce that they’re giving away three skeins of Martha Stewart Crafts Alpaca Blend Yarn to one lucky winner. Read all about the contest (and find out how to enter) right here! For knitters and crocheters who love working with real animal fiber, this super cozy alpaca blend yarn from the Martha Stewart Crafts yarn line is just for you. Composed of 40% wool, 20% alpaca fiber and 40% acrylic materials, Lion Brand has created a yarn that’s high in quality and durability without the huge price tag. Soft to the touch, this bulky weight yarn is ideal for warm winter projects like hats, afghans, gloves, sweaters and cowls. The best part? This yarn is also machine washable, making it easy to care for your handmade garments. The yarn pictured above is shown in the pink shade of Winterberry, but the Alpaca Blend yarn line comes in a variety of exciting colors. From creamy neutrals like Mourning Dove and Buttermilk, to subtle earthy tones like Meadow Green and Magpie, you’ll find a color to appeal to each mood and every season. 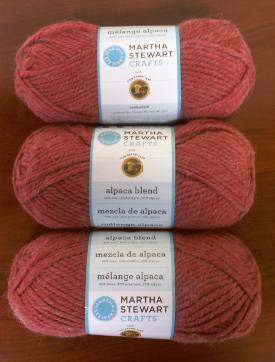 Enter to win three skeins of Martha Stewart Alpaca yarn. Contest ends Jan. 17, 2013. What will you make with this yarn if you win? I would make a shawl out of this yarn if I win it. i’d make my dgd, now back here in alaska from florida, a hat and scarf for her to go out and about in. Honestly, I am not sure what I would make with it. I’d have to hold and touch the yarn and have it speak to me and tell me what it wants to be. I don’t know what I would use it for but I always find a way to use yarn. Like I made a crochet christmas tree skirt and used some of the left over yarn to make a table runner. So more yarn the better. I would make a lovely throw with a rose center for my bed ~~ it’s just the right color !!!! I love, love, love her yarn! My absolute favorite to crochet with and can’t live without it! Best feel and works up great! But I love anything Martha Stewart…truly good quality that you can trust! I am having some new grandbabies this year. The yarn will come in handy! I would like to win the yarn to make a 45-minute scarf from a pattern I got at AllFreeCrochet. Think I’d make mittens and a hat for my granddaughter. I would like to try to make socks.